Where are the bilingual books? ¿Dónde están los libros bilingües? On December 4th. the New York Times published an article about the lack of Latino characters in children’s books. Several groups, among them Publishers Weekly and School Library Journal, stated that there are Latino children’s books being published, but they are not easy to find. 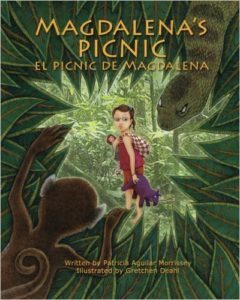 I thought about this when I went to Powell’s Books, in Portland, to review children’s bilingual (English/Spanish) best sellers. I could not find a single bilingual book in the children’s section, the Pink Room. I asked the Powell Lady and she explained that bilingual English/Spanish children’s books are in the Red Room, the foreign language room, right next to the adult literature section. I hope this changes. 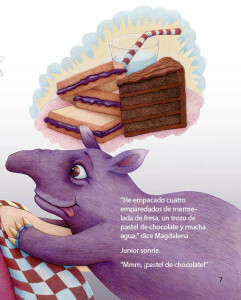 There are many parents looking for bilingual books for their kids who assume all children’s books are together in the Pink Room. 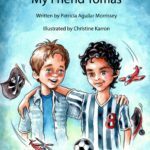 El 4 de diciembre, el New York Times publicó un artículo acerca de la falta de personajes latinos en libros para niños. Varios grupos contestaron y dijeron que sí hay libros con personajes latinos pero que no es fácil encontrarlos. Me acordé de estos artículos cuando fui a Powell’s Books, la librería de Portland, para leer los libros bilingües (inglés/español) más leídos. No encontré un solo libro bilingüe en la sección de niños, el Salón Rosado. Le pregunté a la señorita de Powell’s y me dijo que los libros estaban junto a la sección de literatura para adultos en el Salón Rojo, el salón de idioma extranjero. Espero que esto cambie. Hay muchos padres que están buscando libros bilingües para sus hijos y que asumen que todos los libros para niños están en el Salón Rosado. The book is on the summer reading list of the SCBWI (Society of Children’s Book Writers and Illustrators) where you can also find other wonderful picture books. I hope all bilingual families and those learning Spanish or English enjoy it! Este libro está en la lista de verano de SCBWI (Society of Children’s Book Writers and Illustrators) donde también pueden encontrar otrso libros maravillosos para niños. ¡Espero que todas la familias bilingües y todos los que estén aprendiendo castellano o inglés lo disfruten! The flashlight or the torch? “The American,” said the Powell’s Lady and handed back the Harry Potter book. When it was my turn to pay for Sasquatch by Roland Smith (great grade book for any kid around 7 or 8) I asked about the difference between the American and British versions of the Harry Potter books and was told that the American versions have substituted the British lexicon with words used in the US. So, here in America, Harry and friends run around wearing their sweaters while in the original version they wear jumpers. Why do we underestimate our readers? Are we wasting an opportunity to broaden language and cultural horizons in American children? ¿Judías verdes, ejotes, vainitas o chauchas? Depende del país de origen. Dada la variedad de culturas que forman los países de habla hispana tenemos, especialmente en el área de alimentos, una variedad enorme de vocablos que representan exactamente lo mismo. He ahí el dilema. Al escribir libros bilingues, ¿qué palabra usar? ¿Debemos ser fieles al lugar donde ocurre la historia? o como autora, ¿debo usar mis regionalismos? Mmmm. For the past year I have been writing bilingual stories – es decir cuentos en español y en inglés … and I have come to a fork in the road – literalmente, un tenedor en la carretera o, mejor dicho, una disyuntiva: bilingual or embedded? So, while bilingual enables me to write either in English or Spanish to my heart’s content – con el corazón alegre o, mejor dicho, tanto como quiera, when writing embedded stories I have to think about syntax, precise word choice and if the reader, non Spanish speaker, will understand the word(s). Her favorite sweater was made of wool and kept her warm through the cold nights. Her favorite sweater was made of lana and kept her warm during the cold nights. So, as a non Spanish speaker can you figure it out? Could lana mean silk? leaves? or logically, wool? On the other hand, most readers don’t want to work as they read. They will be expecting the full translation, at the bottom of the page: Su chompa favorita era de lana y la mantenía abrigada durante las noches frías. Next time you are browsing through children’s books, go to the bilingual section and look, you will find both.